Most commonly kept snakes are adaptable. Some are quiet, some are positively secretive, and a few are active. Some are nocturnal, some are diurnal. Although free snakes may wander widely, most quickly adjust to the confines of a terrarium. What do snakes do? Perhaps this question needs to be qualified, for if we're talking about captive snakes the direct answer would have to be not much. Except in rare instances, they don't have the space to do much. However, in the wild, a snake's behavioral pattern is much different than those of their captive brethren. Most commonly kept snakes are adaptable. Some are quiet, some are positively secretive, a few are active. Some are nocturnal, some are diurnal. Although free snakes may wander widely, most quickly become accustomed to the confines of a terrarium. Give a tree snake a perch and visual barriers, give a sand boa a substrate through which it can burrow, or give a pine snake a simple cage with a hide box, and it is quite probable that they will thrive. Captive snakes seldom have the space to prowl, or the need to do so. In the wild, prowling is usually undertaken in search of food, water, a mate or new territory. In captivity all but the latter of these are all brought to the snake, and in theory, since each time its cage is thoroughly cleaned most traces of a snake's life are removed, it is constantly afforded new, albeit small, territory as well. For example, for the timber rattlesnake, a venomous species often associated with mountainous regions in the northeastern United States, winter can come early and spring can arrive late. Some timber rattlers may hibernate for more than five months of the year, then may simply quietly thermoregulate in the proximity of the den for a month on either side of its hibernation period. This leaves the snake only four months or so during the warmest part of the year to wander, feed and breed. And wander they do. Some timber rattlers can be found in mid-summer a mile or more from the denning site. During their wanderings, timber rattlers find and stake out rodent trails on which to ambush prey (some may catch only one or two squirrels in an entire season), ascend into low trees and shrubs, occasionally swim and do other things known to be a part of the natural activity pattern of this snake species. What is the activity pattern for this same snake in captivity? It's apparent from the outset that its meanderings will be dramatically shortened and its quest for food will be significantly improved. Rather than having the latitude of wandering over distances of a mile or more, the snake's entire world will be reduced to a terrarium bottom that probably measures no greater than 24 by 72 inches (and is often smaller). Yet, they thrive in such conditions and seem to show no distress. Some snakes hunt actively rather than from ambush. Among these are the American racers and whipsnakes. These snakes frequent old fields and open scrub where visibility is relatively unimpeded. As they hunt, they hold their heads above the surrounding vegetation (in a periscopes-up manner) watching for movement by frog, mouse or other small animal. Snake species that are active hunters are usually possessed of a nervous irritability, bite readily when handled and can be slow to acclimate to captivity. When caged, racers and whipsnakes persistently try to escape and will damage their noses by pushing against cage sides. The actions and reactions of these snakes in captivity are typical of snakes in general. Ambush hunters usually quiet quickly and acclimate well; active hunters can be more problematic. Ambush hunting. A great many snakes lie in partial concealment next to a small animal trail (found by scent) on the ground or in a tree and ambush a prey animal as it wends its way along what is probably a familiar footpath. The prey animals may be overcome in one of several ways. They may be envenomated and released to die, then trailed by the snake and eaten (many terrestrial vipers and pit vipers utilize this hunting method). Or the prey animal may be envenomated and held until it dies (arboreal vipers procure prey in this manner). 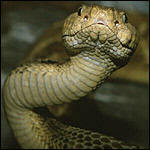 Thirdly, the prey animals may be seized and constricted until dead, then swallowed, as is done by rat snakes and boas. Or lastly, the prey may be seized and swallowed while still alive, as is the habit of garter snakes. Active hunting. Snakes that are active hunters are usually fast-moving species that watch for and actively pursue their prey. Besides the racers and whipsnakes already mentioned, indigo snakes are active hunters. Some snakes combine the two methods of hunting, but do so with a twist. Kingsnakes and rat snakes are both adept at ambushing prey, but also may trail a mouse or lizard to its resting place, overpower and consume it. Kingsnakes and milk snakes are particularly adept at finding and eating a nestsful of baby rodents. Caudal luring. A few species use deceptive ploys to catch prey. Among these are the juveniles of some pit vipers and many dwarf boas that have a bright yellow to cream tailtip. This color contrasts sharply with the body color. The deceptive ploy is termed caudal luring. The snake coils, then elevates and sinuously writhes the yellow tailtip near the head. A hungry lizard or frog, apparently believing the wriggling tail to be a succulent caterpillar or worm, approaches and becomes the meal for the snake. Pit vipers and some boas and pythons have heat receptive facial or labial (lip) pits that allow them to strike accurately at warm-blooded prey even in the absence of light. Many snakes climb readily. Some are primarily arboreal, such as red-tailed green rat snakes and tiger rat snakes, and are usually seen in the trees, but do descend rather frequently, and may even be found coiled on the ground in secluded areas. They are at home in either habitat. Many are persistently arboreal, such as the green tree python and emerald tree boa. They seldom descend and, while not uncomfortable when on the ground, are obviously far more at ease when aloft. Many of these persistently arboreal species have a strongly prehensile tail. Many of the arboreal snakes bite as persistently as they climb. Arboreal snakes should be housed in vertically oriented terraria with horizontal perches affixed at various levels, but especially near the top of the cage. Use natural perches – manzanita, citrus, or other hard wood – but many hobbyists provide perches of PVC. We do not believe PVC perches provide the natural traction that many arboreal snakes require to feel secure. Many of these arboreal species are beautifully colored, and although many are not easily handleable, they make a beautiful display in a terrarium planted with cascading vine plants. At the other extreme are fossorial snakes – snakes that burrow. Some examples of these are the popular sand boas and the seldom-kept sand snakes. Other snakes (such as the many races of the milk snake) burrow as well, but are somewhat less modified for doing so. The true burrowers, the snakes with countersunk lower jaws, may be maintained with a substrate of fine sand. The milk snakes and other less specialized species are better kept on a substrate that won't get in the mouth and nostrils. A substrate of fallen leaves, aspen shavings, cypress-bark mulch or similar loose material will allow the snakes to remain safely hidden beneath the surface. Providing a hide box or other area of seclusion is given, these less specialized snakes can even be kept on a newspaper or rolled-corrugate substrate.